I was thinking about demo events. Findlay OH is on saturday and I'm thinking about any way possible to turn someones head to a kiting area. Now demos are great, yeah, but if someones not looking over there, what else could get them to notice something? The only thing I can think of is music. Popular music that people like today between 2 and 4 mins. If you guys have any suggestions, by all means please post them. As some of you know, I'm a classical music major and to be honest, I dont really listen to much else besides classical music and soundtracks. If there's any music at all that you'd like to recommend, I'll take a listen forsure. I freefly everything, even in comps, so any piece will do. This is mostly an experiment to see if this works, and if it does I'm going to keep flying to stuff that a lot of people know, and stick with what I like in the competition area. The general consensus is that rock or pop music is too repetitive to be used well in competitions. For demos, to attract the non-flier, you would need a hit that transcends time or something very current and huge. I'd suggest any recent Lady GaGa song. Bad Romance has over 261 MILLION views on Youtube. It's too long, but you can always make a shorter version or just ask the people to fade it near 3 or 4 minutes. There are several LGG songs with over 100 MILLION hits. Just listen to a few and pick out the one that offends you the least. For many of us, she is Lady GagME. Those are on my iPod between 4 minutes and 3:44 that may be appropriate. Got lots more if none of those strike your fancy. Several people were badly injured in a stampede at the Findley, OH kite festival today. Apparently, a flying demonstration was choreographed to loud music(?) by Lady Gaga - the exact tune was not reported but they all sound the same anyway. The stampede started as festival goers tried to exit the area to escape the noise (defined by Ambrose Bierce as "a stench in the ears"). Police and the EPA are investigating and say charges are likely. Could not resist - YMMV. Kind of catchy when I want to move with some energy. Personally, I like your flying to classical and think it works extremely well. Truthfully classical music isn't really one of my favourite genres out there though I do appreciate why some people say its great for kite ballets due to the inherent dynamics normally contained within. One of my favourite musical genres that I think could be pretty close is Post Rock (http://en.wikipedia.org/wiki/Post-rock). They have probably the same leanings as classical music but with a more "rock" feel to it. Changing dynamics are also structurally an integral part of its flow. However the problem is its hard to find a good post rock song that is 3 - 4 minutes. A lot of those songs are like over 8 minutes! Been listening to some new music from the "Yeah Yeah Yeahs" that you may wanna try. Fairly new stuff. Try Gold Lion, Zero or Heads will roll. Those are fun to fly to and have been getting priority play in my MP3 lately. Another new group is MGMT - not sure how their stuff would work to fly to though. If you're not tapping your feet to this one, you ain't got a pulse. And the song name is kite themed. Wow the only one Ive heard of is LGG and the yeah yeah yeahs. When i read this i found a few of my faves.. Since you said you were trained in music have you ever composed your own beats to fly to? Watch a few episodes of America's Got Talent and grab something from there - they have already done the research for an hip song that is a sure crowd pleaser. Some beautiful cello. The solo that starts at about 4:00 is haunting. Maybe a rev routine one all black rev one all white rev... it would go with the discussions on the all black and all white kites... They only fly in reverse, I am seeing some potential here. This one is just a few seconds to long, but I love it. Have you listened to anything by Ludvico Einaudi? 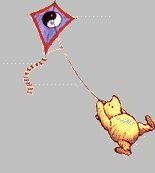 Excellent for flying kites to!